Few days back, I received a mail from Kalyani asking me to write a guest post for her blog. I had to reread the mail few times to grasp the content and the message in the mail as I was totally exhilarated to get the mail. Getting to guest post in just 2-3 months of starting my blog is very encouraging and deep down I feel a slight sense of acheivement too. I've been wanting to start a blog for a very long time but needed a slight nudge to justify my thoughts. Born in a typical Iyer family, I was primarily exposed to South Indian cuisine. The need to start learning the basics of cooking was part of my upbringing. But the curiosity to try different cuisines and experiment with food grew after I got married. My husband is a big foodie just like me and the curiosity and creativity to try new recipes with new ingredients are abundant in both of us (may be because we both are Geminis). We try many vegetarian dishes not just from the vast and diverse Indian cuisine but from other parts of the world too. The possibility of creating and experimenting different cuisines with Indian flavors and my personalization to suit my family’s taste palate makes me act like a child with a new toy. We have two adorable kids and they inspire and encourage me to try new recipes and provide a honest feedback which makes it easier to identify the areas where I need more focus and learning. The topic of starting a blog started when my brother started trying the recipes that I gave him over the phone. He jokingly nudged me to start a blog as the recipes I gave him were very detailed and easy to follow and many people like him may benefit was his reasoning. The idea of blogging was there in my mind but had little apprehension to start one, you can call it the reservation one might have to enter unknown waters. But once I had another person saying its worth a shot, I started the groundworks of starting a blog immediately. Within a week my blog was up and running. I love virtually meeting many fellow bloggers, learn, share, and appreciate one another. I'm happy that I didn't give way to my apprehension rather overcame it. Now blogging is "My World". When that came from my brother, I acted like a child eagerly waiting to open a chocolate wrapper. For most part I'm a self-driven person, meaning if I really want something, I don't need any outside motivation to work on it and would automatically put my heart and soul in it. My blog "is" my heart and soul. The passion to cook and create new recipes just inspires me every time I step in to my kitchen and I need more than one lifetime to taste and create different vegetarian dishes from around the world. 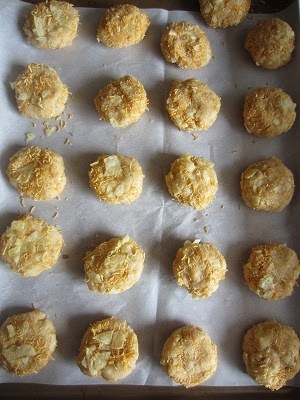 This recipe just made me sit up as I was browsing the "Crazy about Cookies" book by Krystina Castella . 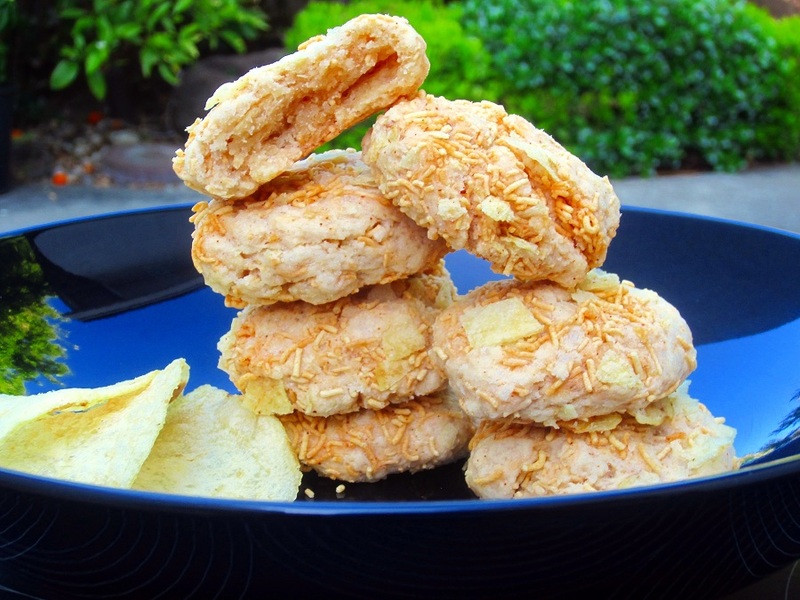 I really liked the out-of-the box idea of making cookies with potato chips. 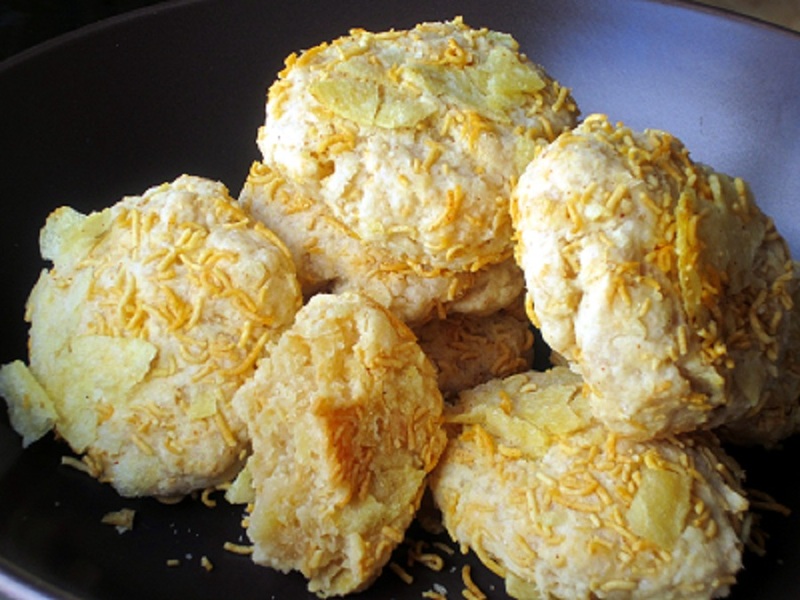 I used the idea from the book but added my personal modifications by reducing the fat in half and adding almond milk and silken tofu to enrich the taste of the cookies more and added some fine sev to give a little Indian twist to the recipe. 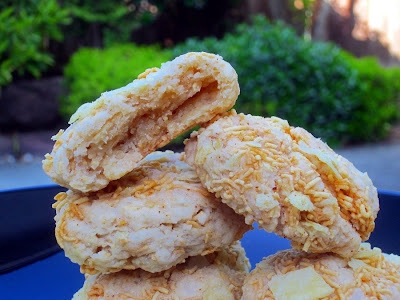 The cookies were salty and sweet at the same creating an electric taste that just makes you say "wow" for every bite and crunch. 1. In a bowl, mix potato chips and fine sev together and keep aside. In another bowl, beat butter and sugar until light and fluffy. 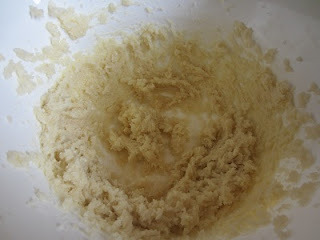 Add flour, vanilla extract, chips-sev mixture (1 cup) and combine well. 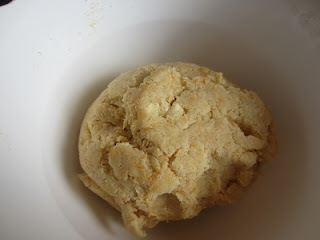 Add almond milk and tofu little by little and combine to make a soft dough. 2. Divide the dough in to 20 pieces and make small balls from each piece. Roll the balls in the remaining cup of chips-sev mixture and place it on a parchment paper lined cookie sheet. Flatten a little and bake in a preheated 325F oven for 12-15 minutes. Let it cool completely before serving. Store remaining cookies in airtight container and Enjoy!!! 1. You can substitute almond milk to any other milk of your choice. 2. You can also skip using almond milk and silken tofu and make it a high fat cookie by adding another 1/2 cup of butter, if desired. 3. 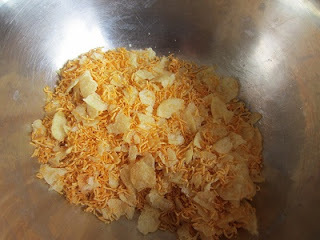 I added fine sev, but you can substitute sev with another cup of potato chips. 4. Any flavor of potato chips (spicy ones), tortilla chips, pretzels can be added in place of the lightly salted potato chips. salty & sweet in the same bite...what a unique cookie...look so good! What a novel idea of making cookies..will give it a try.. Superb! !Lovely, crispy and perfect cookies..
unique way of making cookies, Thanks Jayanthi for sharing it. These cookies are unique and yum. i love them and will definitely try them out. Excellent and quite an addictive cookies. Sounds like a unique cookie. scrunch munch delicious... and lip smacking !! !